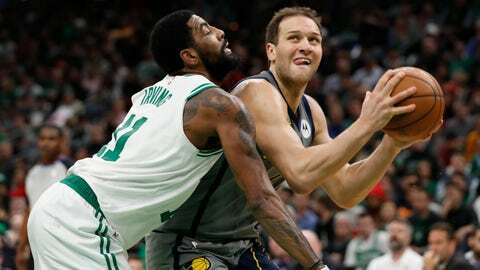 Bojan Bogdanovic and the Pacers square off against Kyrie Irving and the Celtics in a first-round playoff series. FOX Sports Indiana, the television home of Indiana Pacers basketball, will televise Games 1, 2 and 3 of the Pacers’ first-round playoff series vs. the Boston Celtics. Game 4 will air exclusively on ABC. Start times and television networks for Games 5, 6 and 7 will be announced at a later date. The Pacers’ first-round playoff schedule is below.